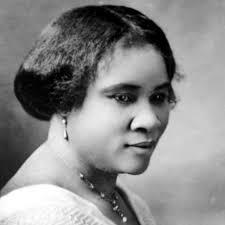 Sarah Breedlove (December 23, 1867 – May 25, 1919), known as Madam C. J. Walker, was an African American entrepreneur, philanthropist, and a political and social activist. Eulogized as the first female self-made millionaire in America,] she became one of the wealthiest African American women in the country. Walker made her fortune by developing and marketing a line of beauty and hair products for black women through Madame C.J. Walker Manufacturing Company, the successful business she founded. Walker was also known for her philanthropy and activism. She made financial donations to numerous organizations and became a patron of the arts. Villa Lewaro, Walker’s lavish estate in Irvington-on-Hudson, New York, served as a social gathering place for the African American community. The Madame Walker Theatre Center opened in Indianapolis in 1927 to continue her legacy. Both of these properties are listed on the National Register of Historic Places. From my friend Leon’s blog. The life of an interesting woman. Great story. I reblogged it. Thank you. Very good story about Madam CJ Walker. She is always mentioned during Black history month and when it comes too building wealth in the black community here in these United States..